AC2 = AB2 + BC2 - 2BC × BD. AD ^ CD, then AC? = AB2 + BC2 + 2BC × BD. Congruent triangles: Geometrical figures which have exactly the same size and shapes are called congruent. The symbol so is used to indicate congruent to'. Two triangles are congruent if and only if there exist a correspondence between their vertices such that the corresponding sides and the corresponding angles of the two triangles are equal. (1) SAS (Side-angle-side) congruence axiom: Two triangles are congruent if any two sides and the included angle of one triangle are equal to the corresponding sides and the included angle of the other triangle. 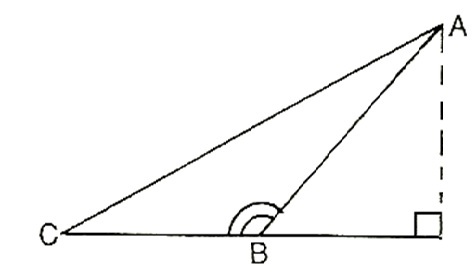 (2) ASA (angle-side-angle) congruence theorem: Two triangles are congruent if two angles and the included side of one triangle are equal to the corresponding two angles and the included side of the other triangle. (3) AAS Congruence criterion: Any two angles and a non-included side of one triangle are equal to the correspon­ding angles and side of another triangle, then the two triangles are congruent. (4) SSS (side-side-side) congruence theorem: Two triangles are congruent, if tl1ree sides of one triangle are equal to the corresponding three sides of the other triangle. (5) Two right triangles are congruent if the hypotenuse and one side to one triangle are equal to the hypotenuse and the corresponding side of the other triangle. (i) SAS- Two sides and included angle are correspondingly equal. (ii) ASA- Two angles and included side are correspondingly equal. (iii) AAS- Two angles and one side are correspondingly equal. (iv) SSS- Three sides are correspon­dingly equal. (v) RHS- The triangles are right angled in which hypotenuse and one side are correspondingly equal. We at Expertsmind.com arrange instant online tutoring session in Congruence of Two Triangles math topic. We provide latest technology based whiteboard where you can take session just like live classrooms. Math experts at expertsmind.com make clear concepts and theory in Congruence of Two Triangles Math topic and provide you tricky approach to solve complex Congruence of Two Triangles problems.